No one has the foodie �bells and whistles� like Sur la Tabla when it comes to fabulous looking and highly practical cooking and serving accessories. The patio table settings now available at the popular culinary coup destination are as beautiful as they are safe, and will last for many memorable meals. 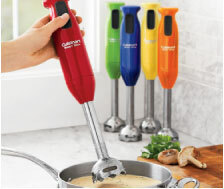 Cuisinart has released some exciting new products, including a delightful small chopper and wand mixer for easy use on the patio preparations that work like a charm for marinades, sauces or salsa, but they are also stylishly color coordinated. 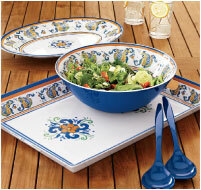 The Sur la Tabla �dragon flower� unbreakable dinner ware for summer brings a touch of sophistication to your outdoor dining, and comes with matching everything, including utensils in coordinated colors, as well as cocktail and wine glasses, place mats and napkins, and very chic aprons. Everything for outdoor food preparation and enjoyment is covered by Sur la Tabla for easy preparation on your Weber Q140 grill. 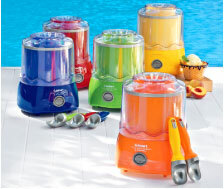 They have vegetable or stainless corn cookers, ka-bob tools, fish grates for grilling everything from shrimp to turbot and they also have just the right grill griddles to make sausage with pancakes for family breakfast on the patio or at the beach. Coffee makers, juicers, every kind of fruit prep tool and last but not least, the ultimate must have for any great or wishing to be great chef, outstanding knives. Did you know Sur la Table offers free knife sharpening? I myself use a Chef Choice hand sharperner, which works great for me, but I like my large knives professionally done. Visit www.surlatable.com for locations and hours of operation or shop online. Bon Appetit! When cooking enthusiasts look for flavor-boosting secrets, roasting spices rises to the top as one of the most accessible take-home techniques. With new McCormick Gourmet Collection roasted spices, it�s easy to enjoy these richer aromas and more robust flavors � without the time and temperature guesswork involved when roasting spices. The flavor experts at McCormick have made it simple for home cooks to skip that extra step with new McCormick Gourmet Collection roasted ground spices: cumin, cinnamon, ginger, and coriander. An essential technique in many global cuisines, the flavorful benefits of roasting are becoming more broadly appreciated by American cooks, thanks to the popularity of cooking shows, chef-inspired recipes and international dishes. Add Distinct Depth: Give dimension to Southwestern, Indian, and Moroccan dishes with Roasted Ground Cumin � one of the featured spices in the McCormick� Flavor Forecast� 2010. Enjoy its full, earthy notes in recipes like Roasted Cumin-Crusted Grilled Steaks with Tomato Relish. Enhance Sweetness: Similar to the taste of red-hot candies, roasting cinnamon brings out a pleasantly strong and sweet flavor in desserts like Banana, Cherry and Roasted Cinnamon Bread Pudding. Roasted Saigon Cinnamon is also a great addition to mole recipes, spice rubs and dishes that do not require cooking, such as fresh fruit and yogurt. Savor Warmth: Roasting ground ginger balances the spice�s sharp notes for a warmer, rounder flavor in recipes like Roasted Ginger Vegetable Stir-Fry. Highlighted in the on-trend flavor pairings in the McCormick� Flavor Forecast� 2010, Roasted Ground Ginger is incredibly versatile, and brings a mellow sweet heat to barbecue sauces, chutneys and marinades. Awaken Aromatics: The spice�s light, lemony notes are deeply intensified in Roasted Ground Coriander. Great in Indian and Middle Eastern recipes, roasted coriander is a flavorful addition to dishes like Roasted Coriander, Chickpea and Lime Rice. Visit www.mccormickgourmet.com for more information about McCormick Gourmet Collection, as well as more delicious usage ideas and recipes. Seattle-based Sur La Table, the premier retailer for creative cooking and artful entertaining, celebrates the Fourth of July with its colorful American collection. 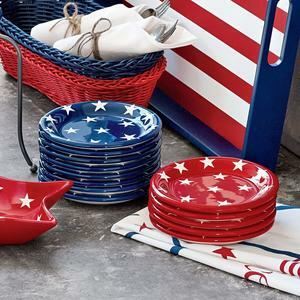 Flag-themed ceramics and colorful accessories brighten the table for summer get-togethers. Retro galvanized metal accessories and clever collapsible portable tables are great for cookouts and outdoor entertaining. Pretty glass beverage jars provide the perfect solution for serving refreshments to a crowd. 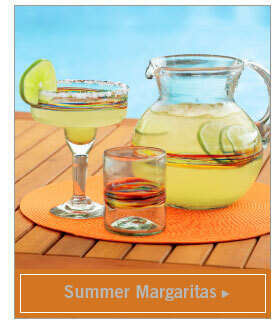 For more tastes of summer living, visit our stores or surlatable.com. WHERE'S THE BEEF? 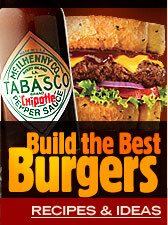 Here's a Recipe from the California Beef Council! Combine glaze ingredients in 1-cup glass measure. Microwave on HIGH 45 seconds, stirring once. Brush on beef steak. Alternately thread vegetables onto four 12-inch metal skewers. Combine mustard and oil; brush on vegetables. Place steak and skewers on grid over medium, ash-covered coals. Grill steak, uncovered, 17 to 21 minutes for medium rare (145�F) to medium (160�F) doneness, turning occasionally. Grill vegetables 6 to 10 minutes or until tender, turning occasionally. Carve steak; season with salt. Serve with vegetables. Companies now have an easy way to demonstrate commitment to global health with the launch of MASSIVEGOOD�s corporate program, which lets them integrate a simple donation solution into their corporate travel systems. MASSIVEGOOD corporate is being unveiled today at the annual conference of the Global Business Coalition for HIV/AIDS, Malaria and Tuberculosis (GBC) in Washington, DC. This year, the GBC will award special honors to Condoleezza Rice, Former US Secretary of State, the National Basketball Association, among others, and feature MASSIVEGOOD as an initiative that can add new meaning to business travel. MASSIVEGOOD�s program for leisure travelers was announced during the UN General Assembly in September 2009, and went live in the United States on March 4th, 2010 in New York, during a ceremony at the UN in which President Bill Clinton and UN Secretary-General Ban Ki-moon were the first to �click� on MASSIVEGOOD. The leisure program allows individual travelers to easily and securely donate $2 when they book travel reservations on websites like Travelocity and Accor, and through travel agents. �Micro-contributions� are used to fight HIV/AIDS, malaria and tuberculosis and to improve the dismal state of maternal and child health in the developing world. Now, with MASSIVEGOOD corporate, companies can also donate to MASSIVEGOOD, and encourage their employees to donate as well when they travel for business, through a technology solution developed by the Global Distribution System (GDS) provider, Amadeus. Companies can activate their MASSIVEGOOD corporate account on www.massivegood.org and can opt to match employee�s micro-contributions or donate additional funds on their own. �Frequently traveling to the corners of the world, business travelers are more likely to have seen and experienced firsthand the challenges and conditions facing our global communities. Amadeus is pleased to deliver the technology that will enable these global citizens to easily make a donation -- and a difference -- with a simple click each time they book a travel reservation,� said Kay Urban, president and CEO, Amadeus Americas. Leading travel management companies including American Express Business Travel, BCD Travel and Carlson Wagonlit Travel along with major online booking tools including GetThere from Sabre, e-Travel Management from Amadeus and Cytric from iFAO and others are committed to make MASSIVEGOOD a reality for corporations and business travelers. Aside of the support from the Corporate Business Travel sector and the GBC, giants such as the World Travel & Tourism Council, Amadeus, Sabre, Travelport, Mondial Assistance, Accor, Voyageurs du Monde, Club Med, Travel Corporation, BCD Travel, Travelocity, Delta Airlines, PhoCusWright and ASTAalready support MASSIVEGOOD. MASSIVEGOOD was created by the Millennium Foundation for Innovative Finance for Health. Funds will be distributed in priority to UNITAID, an innovative funding mechanism for the purchase of drugs that has already saved millions of lives by lowering the price and increasing the availability of key treatments in poor countries. The Millennium Foundation for Innovative Finance for Health ("Millennium Foundation") is a Swiss not-for-profit organization created in 2008 whose mission is to create a sustainable source of needed additional funding to achieve the three health-related Millennium Development Goals agreed to by the United Nations in 2000: to treat and fight life-threatening diseases, including HIV/AIDS, malaria and tuberculosis; to reduce childhood mortality; and to improve maternal health. To achieve its mission, the Millennium Foundation aims to inspire and empower citizens to join a global movement of solidarity dedicated to reducing the glaring inequalities in access to health care between rich and poor. The initial focus is the creation of MASSIVEGOOD, an innovative fundraising solution that makes it easy for all those who travel to make micro-contributions aimed at saving lives by fighting life-threatening diseases among the world�s most vulnerable populations. For additional information, visit: http://www.millennium-foundation.org. For the best in local farm to table produce, acclaimed chefs from all over the Los Angeles area schedule Wednesday and Saturday mornings for a trip to the oldest and most respected certified farmers� market in California: the Downtown Santa Monica Farmers� Market, which features 75 farmers and takes up more than 4 city blocks. Whether these chefs are hunting down the best new potatoes, rainbow chard, beets, spring onions, white corn, artisan cheeses or exotic spices, they are sure to find not only the rarest, freshest ingredients, but the highest quality. Two of those chefs who regularly buy their produce just outside their restaurants' doors in Downtown Santa Monica are Roberto Maggioni, Executive Chef of Locanda del Lago and Raphael Lunetta, Owner and Executive Chef of JiRaffe. They agreed to share two of their favorite summer recipes made entirely of ingredients they gather at the Santa Monica Farmers� Market. 3 medium red beets, 2 tbsp. Banyuls vinegar, 1 cup dried cherries, chopped, 1/4 cup grapeseed oil, 1 cup walnut halves or pieces, 1 tbsp. chives, chopped, 1 shallot, peeled and minced, 1 cup sugar, 1 tsp gresh ginger, minced 1 1/2 cups goat cheese, 1 tbsp Italian parsely chopped, 2 large tomatoes, skinned, seeded and diced. Roast beets: Preheat oven to 350 degrees. Wrap beets in aluminum foil and place on a baking sheet with a little water. Roast 40 to 50 minutes or until cooked through. Let cool. Peel beets and shred on a box grater. Set aside. Prepare Vinaigrette: In a jar with a tight seal, mix ginger, Banyuls vinegar, grapeseed oil and season to taste with salt and pepper. Shake well and set aside. Caramelize walnuts: Heat corn oil in saucepot. In a separate pot, bring water to boil and blanch walnuts for 4-5 minutes. Drain well. Toss with granulated sugar and deep fry until golden brown. Remove and let drain. Prepare Goat Cheese: Place goat cheese in a food processor and mix until creamy in texture. Remove and place in a pastry bag. To Serve: In a mixing bowl, combine shredded beets with diced tomatoes, dried cherries, caramelized walnuts, chives, shallots, parsley and season with salt and pepper. Toss with the vinaigrette and adjust seasoning. Place a ring mold in the center of a plate and fill with beet mixture. Top with the goat cheese and garnish with chopped chives. Wednesday Hours: 8:30 a.m. to 1:30 p.m.
Saturday Hours: 8:30 a.m. to 1:00 p.m.
Do You Know the Difference Between Tiramisu, Profiteroles, Panna Cotta, and Cannoli? While cooking Italian dinners may not be challenging for many, whipping up Italian desserts are another story entirely. What�s the difference between profiteroles and panna cotta anyway? Whether you�re making them at home or ordering them after a great dinner out, leave it to Chicago�s famed family of Francesca�s Restaurants to define four popular (and delectable) desserts. Tiramisu � One of the most popular Italian cake desserts, tiramisu is comprised of rum and espresso-soaked ladyfingers layered with creamy mascarpone cheese and cocoa. Profiteroles � Profiteroles are deliciously delicate cream puffs. Francesca�s serves theirs with cold, creamy gelato and a warm chocolate sauce. Panna Cotta - Translating to �cooked cream� in Italian, panna cotta comes from simmering milk, cream, and sugar together before combining the mixture with gelatin and letting it set. This chilled vanilla pudding is generally served with fruit or spices. Cannoli - Cannoli is made up of a tube-shaped shell of fried pastry dough, filled with a creamy, sweet filling that generally contains ricotta cheese. At Francesca�s the ricotta is homemade! About Francesca�s Restaurants: Since 1992, the family of Francesca�s restaurants has grown from a single location on North Clark Street to 20 locations throughout Chicagoland, with plans to open two more. With a focus on exceptional service and quality ingredients, Francesca�s consistently changes the menu to offer the freshest, seasonal rustic Italian dishes. Touted as casual dining in a sophisticated, trattoria ambiance, each individual Francesca�s restaurant has become ingrained in their community, and tailor both their menu and special events such as exquisite wine dinners to match the tastes and energy of their guests. The consistency is in the amazing food, great service and even better prices. For more information, please visit www.miafrancesca.com. Heat oil in small 2-quart saucepan over medium heat; add onion; cook about 5 minutes or until softened. Add ketchup, brown sugar, vinegar, Tabasco sauce and � teaspoon salt. Set aside � cup sauce. Rub outside of pork roast with � teaspoon salt. Place in roasting pan; top with sauce mixture to cover completely. Cover pan tightly with foil and cook 1 hour. Meanwhile, preheat grill to medium. Place pork on grill; cook, covered 30 minutes, turning frequently, and brushing with reserved sauce until meat thermometer reaches 160� F.
Serving Suggestion: Saut�ed green beans and sliced red onion; toss with cooked, crumbled bacon. Leftover Suggestion: Slice leftover pork; place on rye bread; top with deli sliced ham, sliced Swiss cheese, pickle slices, mustard and rye bread slice. Press in a pannini machine until sandwich is golden and cheese is melted. Jean Francois Meteigner is chef/owner of La Cachette Bistro in Santa Monica. He enjoys shopping for all his ingredients at the local Farmer's Market and shaping new menu items on Southern California's freshest food, giving his classic French cooking a California flair. Meteigner has been honored as Outstanding American Chef by the Grand Masters of America, and 1997 Chef of the Year by the French Culinary Club of Southern California. He has taught at Cedar-Sinai Hospital, Canyon Ranch, and Green Valley Spa; he will soon be teaching his innovative techniques at La Cachette Bistro on Saturday mornings . Meteigner holds the coveted title of Maitres Cuisiniers de France, and has been featured in the best local and national food magazines. Lunch: M-F 12:00-2:30; Brunch Sunday 11:00-3:00; Dinner Sat-Th 6:00-10:00, Fri/Sat 6:00 - 11:00. Happy Hour M-F 5:00-7:00.